San Francisco is an iconic American city and a fantastic place with plenty to explore, so much so that it is hard to know where to start! Let’s begin with transport; the famous cable cars are a great way to explore the city. Jump on and off with ease wherever takes your fancy, at $6 a ride you can’t go wrong. I recommend taking the Powell-Hyde cable car to Fisherman’s Wharf, glimpsing the crooked Nob Hill as you go. The cable car ‘turnaround’ marks the beginning and end of the line, as cable cars cannot reverse the wooden platforms turn them back around. From Fisherman’s Wharf you can stroll at your leisure along the harbour front. 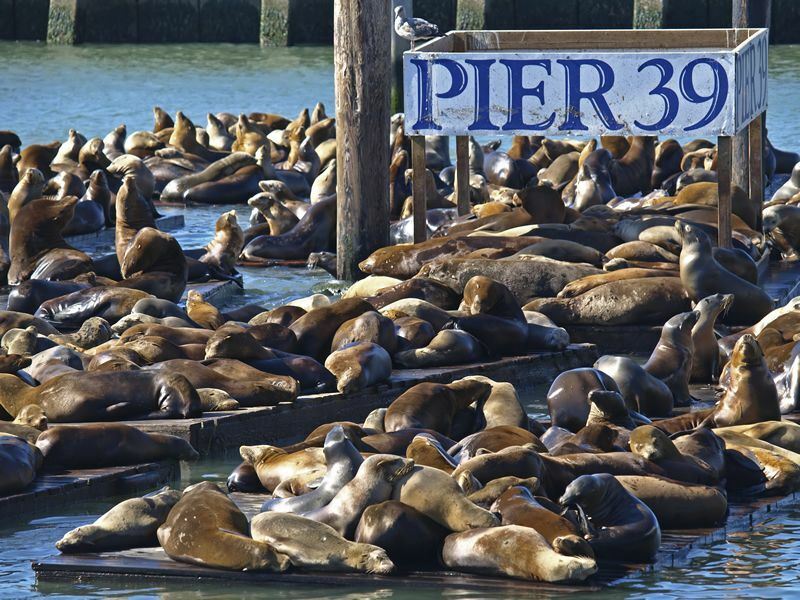 Take a look at the shops and don’t miss the infamous sea lions at Pier 39 as they lazily soak up the sun. If you fancy a spot of lunch there are plenty of traditional seaside takeaways on the pier. Fish chowder served in a giant bread roll is a popular seaside treat and definitely one I would recommend! Continue your stroll along to Pier 33; here you can take a ferry to Alcatraz. Tickets are about $28, to avoid disappointment it is best to book in advance of your trip, as this attraction gets very busy and is often sold out on the day. If like me you get hungry frequently it is a good idea to take a snack with you as there are no food facilities on the island, but you can purchase water. ‘The Rock’ held prisoners from 1861 — 1963; it is such a fascinating place. Collect a headset when you get there and take the audio tour, it is well worth it. Looking inside the cells and listening to the narrative at the same time sent shivers down my spine! Take a walk around outside; there are great views back across the bay towards the city and superb views of the Golden Gate Bridge. Another great way to explore the city is by bike, once you get used to the heavy volume of traffic on the bustling city streets it is fun, I promise! Cycle along the port stopping by the Ferry Building for a refreshing beverage, its a lovely place to sit in the sun and watch the world go by. It is also home to a great farmers market open on Tuesdays, Thursdays and Saturdays, superb for picking up local produce. Continue along the beachfront and through the park to the Golden Gate Bridge, cycle across this impressive 1.7 mile structure and have lunch at the picturesque seaside town of Sausalito. For both Alcatraz and crossing the Golden Gate Bridge I would recommend taking a few warmer clothes as often a mist appears from nowhere and can get quite fresh. If you have time for shopping after all that sight seeing, Union Square has all the stores you need. Tiffany & Co, Saks, and Abercrombie to name a few. Why not take a trip to the to the 8th floor of Macy’s where you will find The Cheesecake Factory, one of my favourite American restaurants and you guessed it, their cheesecake is to die for! Not only that if it’s a nice day sit outside, admire the views from the rooftop and soak up the atmosphere of this wonderful all American city.